The tamale or the hot sauce? This was the start of Carlos and his stunning wife Sandra’s hot pepper sauce empire. Now, tamales have piqued your interest, right? They are one of my favourite foods and super hard to find in Toronto. We have recently discovered and started to demand great Mexican cuisine but it has been a slow time coming. I have been told many times that tamales are so difficult to make, so labour-intensive and like the naive person I am, I believed it. Until I was fortunate enough to score an invite to Sandra and Carlos’ home. I love their home. The kitchen is super simple and reminds me of a restaurant with exposed metal shelving and a big butcher block island in the middle. As I walked in the smell of coffee permeated the air. We had all just been to Rufino Espresso so I knew I was in for some great French Presse. Did I mention that these two incredibly hard working people also own a great coffee shop called Café con Leche, where they make Nutella and Spicy No. 7 lattes? Do keep an eye on them, as when Carlos is in the mood, he will do a mini pop up with his heritage Northern Mexican cuisine. For Carlos’ entire life, his father has believed that they herald from the Aztecs so do bow to the King when you drop in. Tamales are a simple food that takes a little time to master and get comfortable with the feel of the dough or masa. 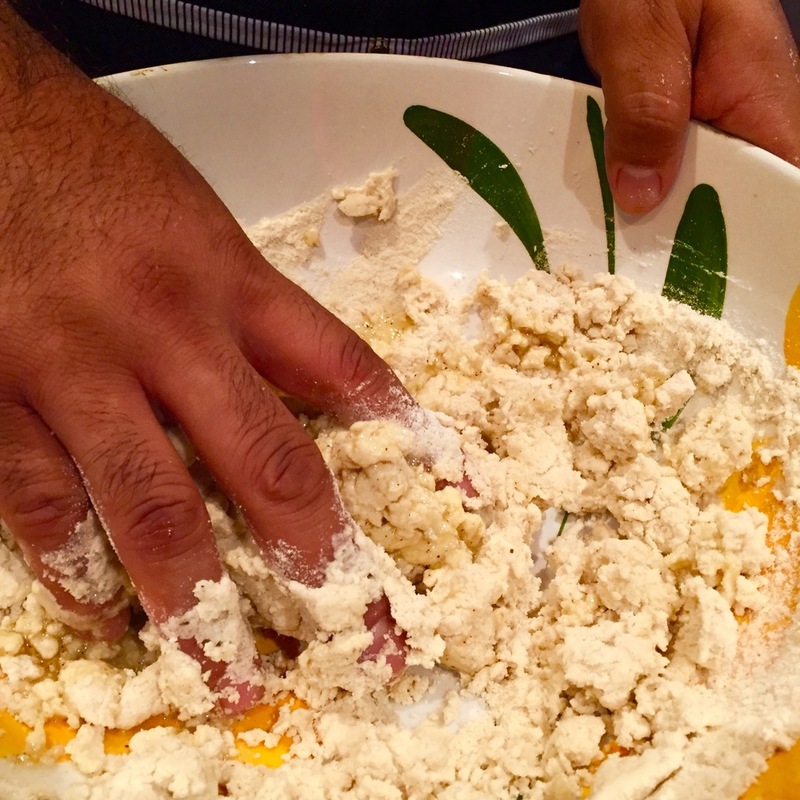 Masa is actually the word for soft corn flour but it is also the word for the finished product. Depending on how thick or thin the dough is, you can make anything from tacos, pupusas, tortillas and tamales. Like all dough it has a few simple ingredients: flour (masa), fat (lard) and water. Easy peasy! The only kicker? You must soak the corn husks overnight. If you forget, let them sit in fairly warm water for at least three hours. ½ cup melted lard, rendered bacon fat, butter or olive oil. In a bowl, add flour, fat and half a cup of water. Begin to mix with your hand. The dough should be sticky and not at all dry, so continue to add water until the dough is sticky but comes off your hands easily. Both Sandra and I were trying to think of a similar texture and we came up with Play-Doh and toothpaste. Now cover and let rest for 10 minutes. When Carlos is looking for inspiration or the exact way to make something, he often calls his mother in California. Carlos and his family immigrated to the United States when he was quite young. His mother begins to tell a story, gets descriptive about sounds and tastes, and Carlos interprets this into the food of his childhood. Both of his parents were incredible cooks - as I said, Carlos’ dad was part of the Aztecs and hailed from Mexico City, so he was used to a more elevated level of cooking than people from more rural areas. His mother was from Michoacan state, which like Puebla, had very gifted cooks. The family demanded local, quality ingredients and his father taught them all to taste the main type of food and not to try and mask it, so simple quality was always on the table. There are many fillings for tamales. Some familiar and classic and some not so much. As with all Great Ethnic Home Cooks one must start with a great foundation in order to spread your proverbial cooking wings. 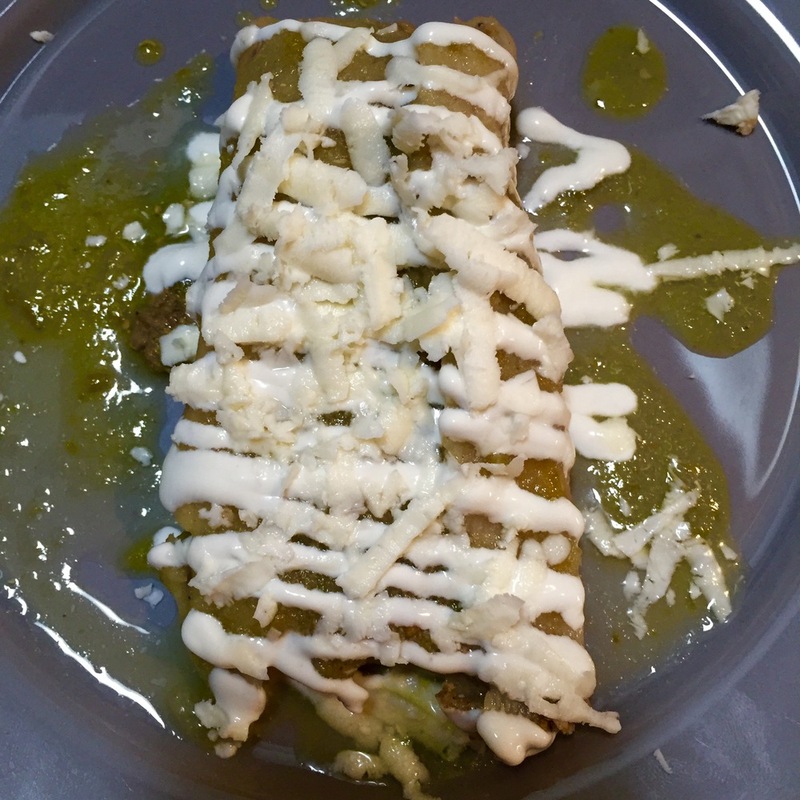 Carlos started with an incredibly classic filling; Chile Verde which translates to "stewed pork in a green sauce." In a pot, add lard or oil and warm. Add pork and turn heat to medium. You almost want to blanche the meat, not brown it. Add salt, pepper and garlic. After 10 minutes add the Salsa Verde below. Cover and simmer for approximately two hours or until pull apart melting, tender. Allow to cool. The Chili Verde must simmer for two hours until you find it pull-apart meltingly tender. Add all ingredients to a blender, blend until smooth and pour over the meat at the correct time in the recipe above. I love this sauce. It is tangy, not overly hot and packed with flavour. Do this same recipe with chicken or turkey, a favourite bird in Mexico, I also think it would be insanely good on a baked piece of white fish or just dip homemade taco chips into it. Let’s put these babies together and you will see how easy they really are. In your hand, place a corn husk with the outer side down. Take a heaping tablespoon of masa and coat the entire husk except 1 inch of the narrow tip in a 1/8-inch smear of the masa. Add a tablespoon of the pork running vertical along the masa leaving a little folding room on each end. One side will have more masa exposed - fold this side in halfway, now the narrow base and then the other side. Seal the top by squeezing it together. If you don’t have enough masa to seal the top just add a bit like glue. Stand all the little tamales in a bowl until they are all done. This recipe should yield you around 25 tamales. Once they are all complete, place them in a steamer standing upright so the filling doesn’t ooze out. If need be in your pot just add a little bowl or some such thing to fill in the extra space if there is any. Tamales need to steam over a low heat for two hours. Check them after an hour and a half by opening one up and giving a taste. The filling should be soft yet firm and taste cooked. To serve the tamales, make sure to add some of the Salsa Verde or No.7 Jalapeño Hot Sauce and some Crema in a squeeze bottle. Crema is a thinner, saltier version of sour cream. I think thinned-out sour cream with a pinch of salt works perfectly. Last but certainly not least is Cotija, a cheese similar to Paneer or Halloumi used to grate on top of the tamal. Take a steamed hot tamal and remove the husk. Place it on a plate and spoon over a good amount of Salsa Verde then a pretty little drizzle of Crema and a dusting of Cotija. Corn husks ready to stuff, fold and steam. Mole spices from an authentic Mexican Molanna. Now for the fun part. Carlos had some incredible dried Mole spices from a Molanna, a mole maker in Mexico who grinds spices to your exact specifications. This stuff is like gold once found. All we did was add some warm water to it to make a paste and then this was added to the masa mixture and we made crazy tamales filled with Cotija. Carlos honoured me by making sweet tamales using my Plum, Lemongrass and Jalapeño Jam. We drizzled these with Crema but if I had had any around, I would have dusted them with cinnamon sugar and zest of orange peel for a gorgeous dessert. If you don’t have this jam, any of your own homemade or great quality store bought ones will do, as would Dulce de Leche, or Sandra’s favourite, Nutella. Tamale with my homemade plum, lemongrass and jalapeno jam. After ploughing through a mess of incredible tamales we sat down to talk over Sandra’s beautiful savoury patties from Doce Minho, one of the best Portuguese bakeries in Toronto. An array of all of No. 7 Hot Sauce was there for dipping the shrimp, cod and meat patties into. No meal in the wonderful world of Great Ethnic Home Cooks is complete without yet another sweet and the Portuguese tarts known as Pasteis de Nata were as always sublime. Savoury patties from Doce Minho Bakery: from left to right: shrimp, meat and cod. When I first came into contact with Carlos it was because a mutual friend said to talk to me about the ins and outs of creating a product for grocery. The first thing I said to Carlos was, “look on the grocery store shelf and tell me how many hot sauces you see.” He responded with “quite a lot” and I said “between mustard, BBQ and hot sauces, you would have to be crazy to get into that business because no matter how good it is, there were a million to compete with.” I believe Carlos listened to what I had to say and he has built a lovely company supplying many high end stores and restaurants. He stands out because his quality and flavours shine and he has stayed away from the mainstream stores. The humble beginnings of No. 7 Hot Sauce. Carlos is also a fighter, in a way that means he works hard and sticks to his guns. This was not always the case because Carlos was a fighter, a real fighter in the gangs of California. I was very honoured that both he and Sandra were willing to share his story and that our mutual intent to spread the word to reduce and prevent violence and drugs - they are not the answer. Carlos was a typical middle class kid coming from hard working parents that came to a new country, and like all immigrants, had to provide for their kids. Around the most difficult time in a child’s age, the preteen Carlos’ parents split. Mom had to work harder and the kids were left to their own devices. It was not hard to run into the wrong crowd and violence and drugs became all-consuming from the time Carlos was 13 until 18. He would later be invited by his Church to lead a youth group in Toronto. This youth group was not necessarily in trouble, but comprised of preteens and teenagers who wanted to get together for dances and activities. Sandra walked into his life and like the love stories in the movies he proposed after their second date. They have been married for 10 years, they sell hot sauce together, run and hang at their coffee shop and go to church trying to help others the same way Carlos received his source of strength. They are incredible people and I am honoured to call them my friends. Drop in for a cup of Rufino at Cafe con Leche and have a chat - you will become their friends, too. Carlos recommends any Latin shop for groceries but his favourite is Perola’s in Kensington Market (247 Augusta Ave, Toronto, ON M5T 2L8). They are moving two doors down in the New Year, so check in on opening and closures. First published: December 15, Inside Toronto.